In the world of Lexus SUVs, it’s the RX that grabs all the headlines. 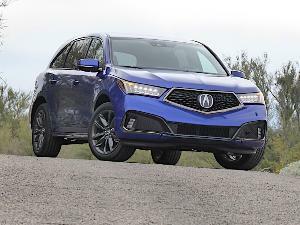 And it should, since it’s available in several configurations, including a fuel-efficient hybrid, and it’s the luxury automaker’s most popular SUV. That said, the 2019 Lexus GX 460 possibly is the brand’s best midsize SUV. 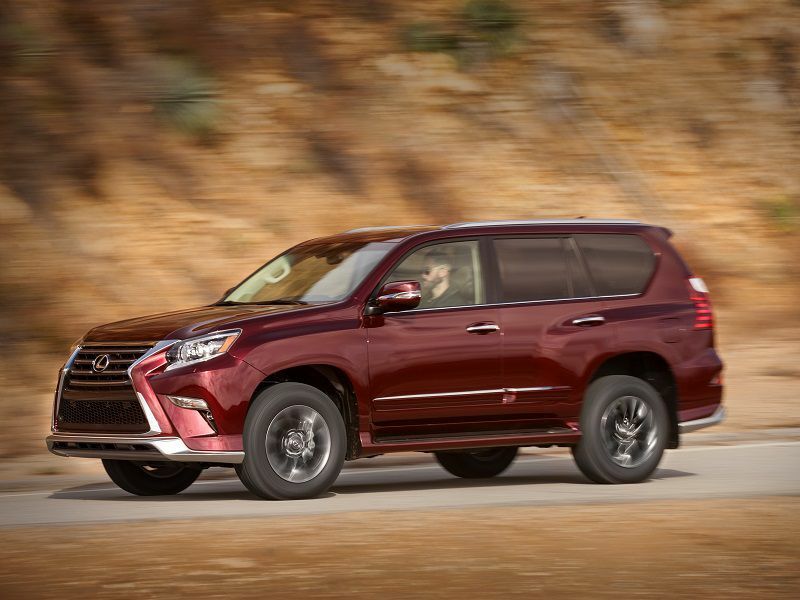 With seating for seven passengers and a powerful V8 engine, the 2019 Lexus GX sits near the top of the brand’s extensive lineup of SUVs. The model’s second-generation was introduced in 2010, and it slots between the seven-passenger version of the RX and the larger V8-powered LX 470. Built in Japan, the family-friendly 2019 Lexus GX 460 offers buyers rugged style and a level of off-road capability unexpected from Lexus. 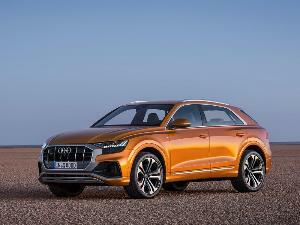 It competes in a crowded class of popular luxury suvs, including the Mercedes-Benz GLE, BMW X5, Volvo XC90, Audi Q7, Acura MDX, and Range Rover Discovery. Lexus offers three trim levels for the GX: Base, Premium, and Luxury. 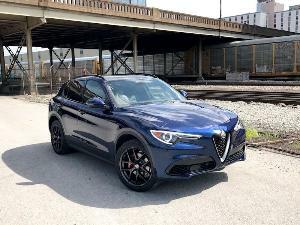 Prices start at $54,405, including a $1,025 delivery charge, and the SUV’s impressive list of standard luxuries includes power front seats, a sunroof, dual-zone climate controls, a nine-speaker premium sound system, and an 8-inch touchscreen. 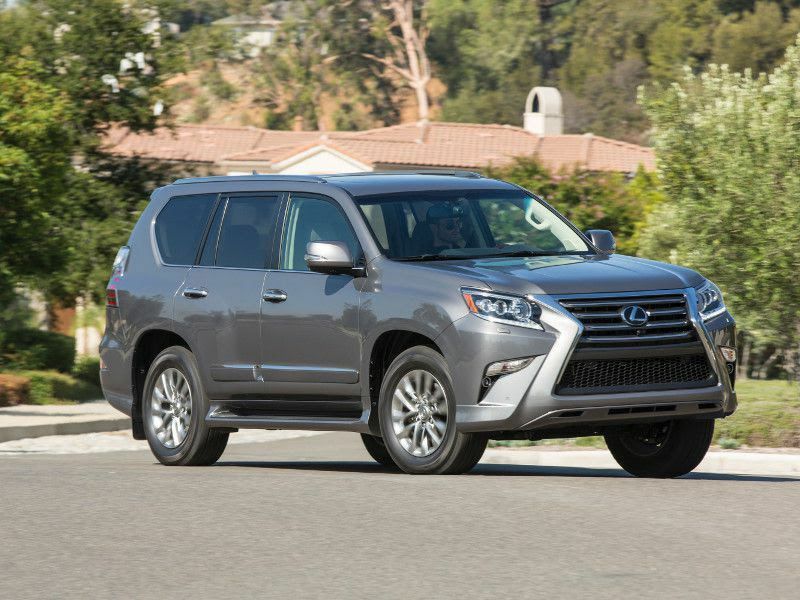 For about $2,500 more, buyers can step up to the 2019 Lexus GX 460 Premium, while a GX 460 Luxury, like our test vehicle, costs about $64,780. With options and extra cost packages, including additional driver aids and safety systems, our tester cost over $73,000. Four-wheel drive is standard on all models, and every 2019 Lexus GX is powered by a smooth, powerful, and refined all-aluminum 4.6-liter V8 mated to a 6-speed automatic transmission. There are more technically advanced powertrains in this class, but the Lexus is packing plenty of power with 301 hp and 329 lb-ft of torque. 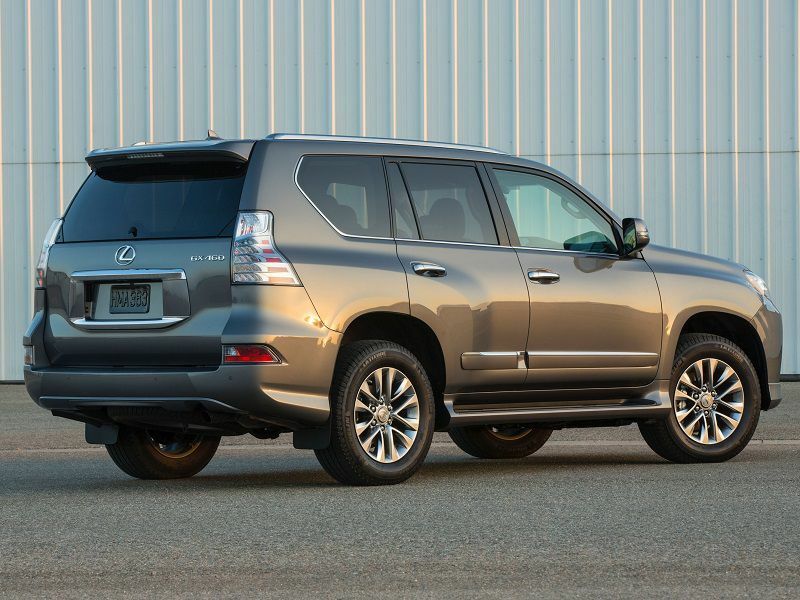 Unlike the Lexus NX and RX models, the GX 460 is not available as a hybrid. 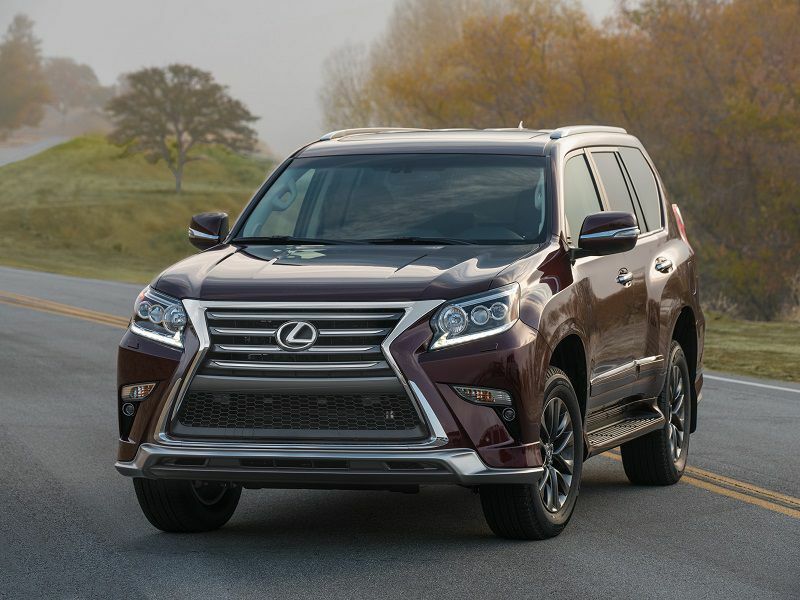 This is a big, comfortable, and refined family SUV, but the 301-hp 2019 Lexus GX also is part muscle car, and it’s quick off the line. This large SUV will hit 60 mph in just 7 seconds, and Lexus says it can tow 6,500 lbs. It may live in a world obsessed with turbocharging and electrification, but the Lexus is packing a big naturally aspirated V8 engine and it’s better for it. Yes, it’s a little old school, but the thrust of that big V8 makes the GX really fun to drive. It also makes merging on the highway stress-free, and you always have enough power to get around that giant road hog of a big rig. Plus, the V8 sounds great, with a subdued rumble that dials up the vehicle’s personality. The downside of that big powerful engine is the Lexus’ fuel economy, which is lower than many of its competitors. The GX is rated 15 mpg city and 18 mpg on the highway. We averaged 16 mpg during a week of mixed driving. While some big SUVs can feel like city buses, the Lexus drives like a luxury car. It handles well, with a satisfying agility missing in many SUVs this size. 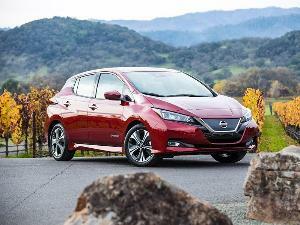 It feels small and light from behind the wheel, and it’s easy to maneuver with tight steering and powerful brakes. Its turning circle is even extra tight, which makes the GX easy to park. The Lexus is relaxing to drive with a plush ride. The GX has a long travel suspension with air springs in the rear, and it soaks up the road wonderfully. The suspension is even adjustable, although it feels exactly the same in all of its three settings, which include Comfort and Sport. Unlike the Lexus RX and most luxury SUVs, the 2019 Lexus GX 460 actually is off-road capable. In this class, only the Land Rover Discovery and the five-passenger Jeep Grand Cherokee can rival the Lexus in the dirt. The GX features tough body-on-frame construction, a locking two-speed transfer case with low range, rugged Dunlop tires, and more than 8 inches of ground clearance. 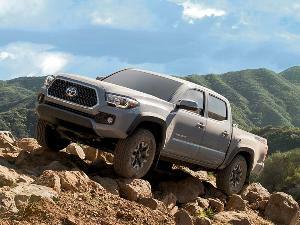 It also shares off-road technology with the Toyota 4Runner TRDPro, which is one of the best off-roading SUVs available. The Lexus gets the 4Runner’s Downhill Assist Control, Hill-Start Assist Control, and its unique Crawl Control system, which make the Lexus easier to drive on hilly unpaved terrain. This is a Lexus, so you expect a quiet, well-isolated interior - and the GX delivers. There’s very little wind or road noise, even on the highway at 80 mph. The interior of the 2019 Lexus GX also is roomy and family friendly. 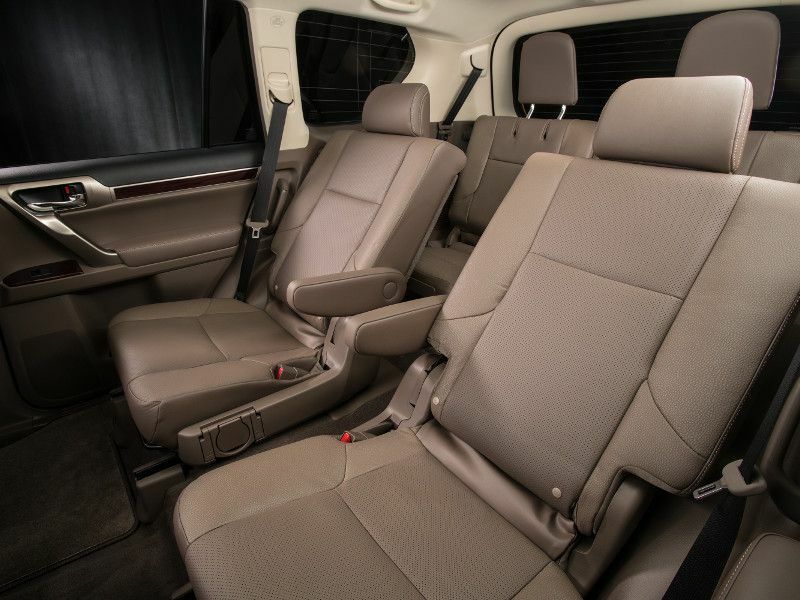 Rear-seat legroom is more than adequate, and the SUV seats seven easily. Its third row even can handle full-size adults if the ride is short. Our test vehicle was equipped with heated second-row captain’s chairs. Although they limit seating to six, they improve third-row access considerably. They’re also more comfortable than the standard bench, with built-in armrests and adjustable headrests, plus they recline. Rear climate controls are standard. Rear passengers also appreciated our test vehicle’s optional dual-screen rear seat entertainment system with remote and wireless headphones. Soft and supportive, the GX’s front seats are a decadent pleasure. And the overall quality of the SUV’s interior is exceptional. The seats are covered in buttery leather. There’s wood on the heated, leather-wrapped steering wheel, and the door handles function with a likable heft. Slam a door and it seals with a solid thud. Visibility is outstanding and control placement is excellent. Its large knobs and switches are easy to find, and they operate with a feeling of quality. There’s also plenty of storage with a deep center console bin, large door pockets, and well-placed front seat cupholders. The driver’s seat is height adjustable for shorter drivers, and a power tilt and telescopic steering wheel is standard. Lexus doesn’t offer a power tailgate on the GX, which is a huge misstep in this class. The 2019 Lexus GX 460 also has an unusual rear-door design. Like the door on a giant industrial refrigerator, it opens out instead of up. There’s also a high cargo floor, and the door opens left to right, toward the curb, which complicates cargo loading. In addition, cargo space is tight behind the GX’s third row. Lexus says there’s 11.6 cubic feet back there, but it seems even smaller. There’s just enough room to smash in a few backpacks. 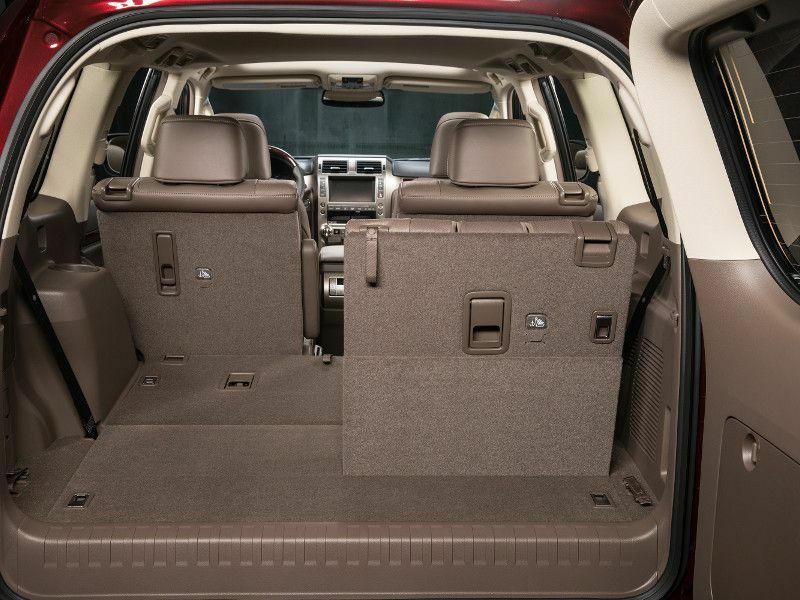 Fold the SUV’s third row, which is split 50/50, and that space expands considerably to 46.7 cubic feet. That’s more than you get in a Volvo XC90, but the Audi Q7 still offers more. A power folding and unfolding third row is standard on the Luxury trim level. With both rows folded out of the way, there’s 64.7 cubic feet, which is small for the class, but proved to be enough for two mountain bikes. When it comes to in-cabin technology, Lexus keeps things simple with the GX 460. This is a good thing. We appreciate its simplicity and ease of function. 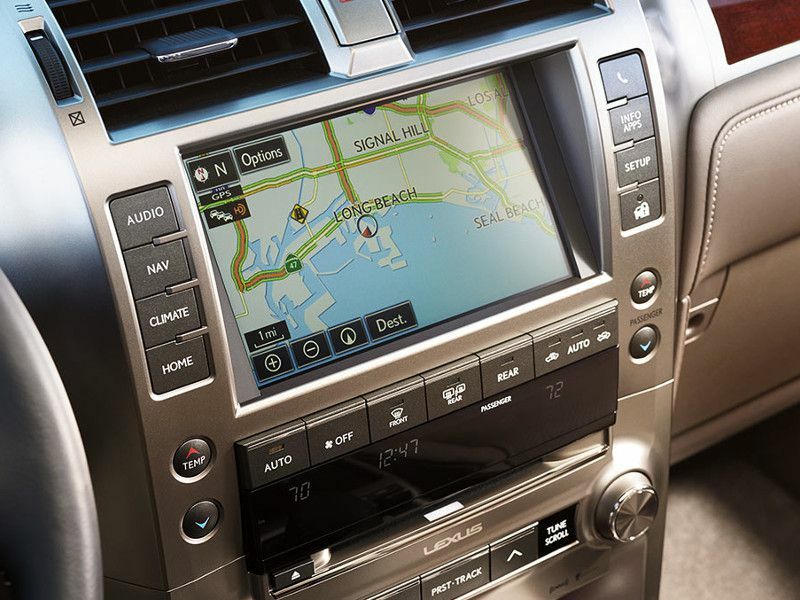 Most Lexus models feature an infotainment system controlled by an overly sensitive small joystick or a touchpad, which can be frustrating to use. This is not the case in the 2018 Lexus GX 460. 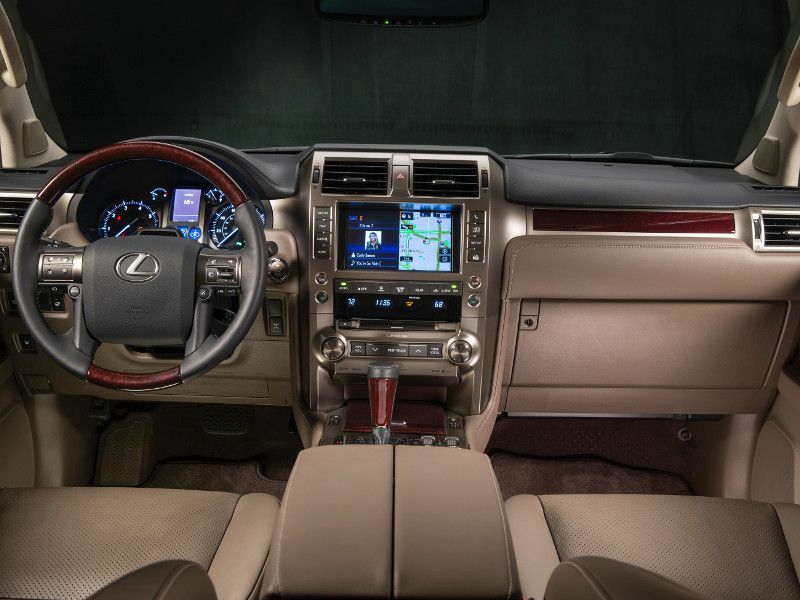 In this SUV, Lexus uses a simple, well-sized touchscreen, placed perfectly within the driver’s reach. We also appreciate the sound quality of the optional 17-speaker Mark Levinson audio system. Unfortunately, the system is not compatible with Apple CarPlay and Android Auto, and onboard Wi-Fi is not offered. The top two trim levels do get a year of complimentary Lexus Enform Destination Assist. Similar to GM’s Onstar, it includes access to a 24-hour live call center which can help you find addresses or a point of interest, and then send the destination right to the SUV’s nav system. 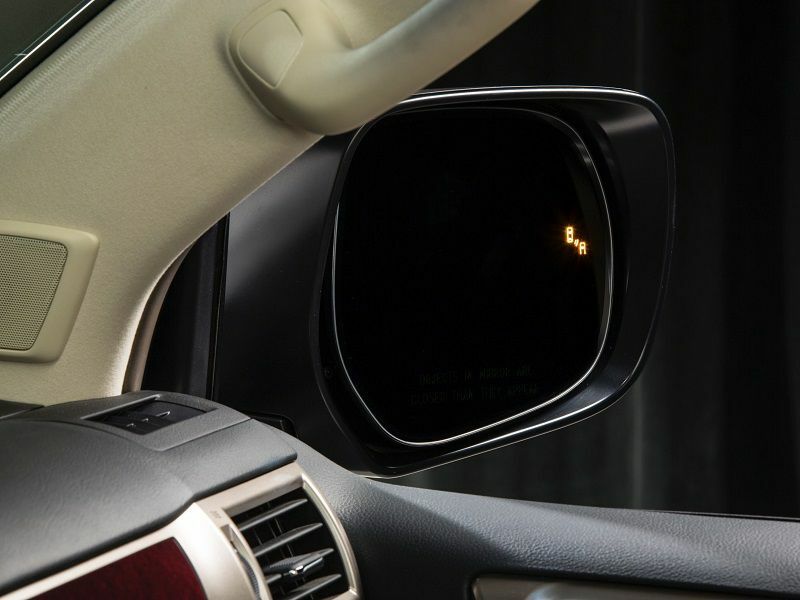 Our GX 460 Luxury test vehicle came standard with Blind Spot Monitor and Rear Cross-Traffic Alert. 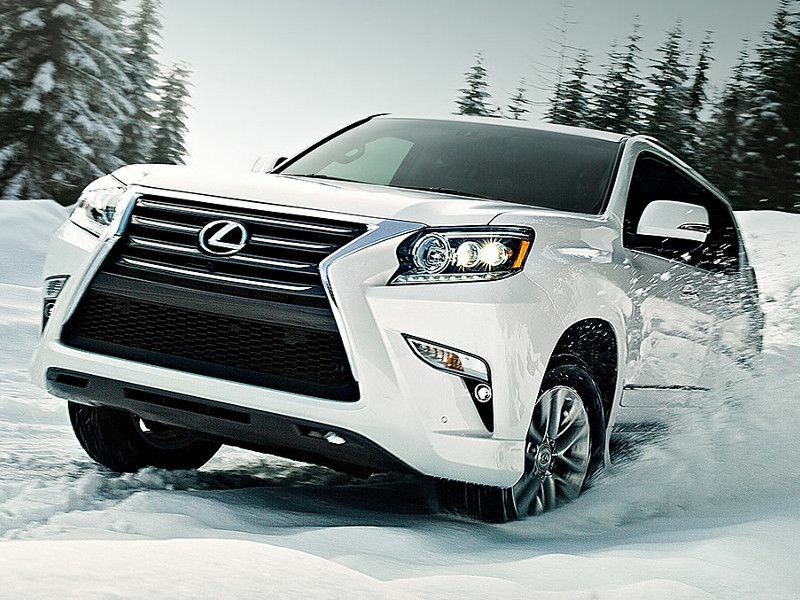 However, many of the Lexus GX’s active safety systems and driver aids are extra cost options. Our test car was equipped with the optional $4,340 Driver Support Package, which added Dynamic Cruise Control, Lane Departure Alert, automatic high beams, Dynamic Radar Cruise Control, Lexus’ Pre-Collision System with Driver Attention Monitor, and an enhancement to the backup camera that offers side and front views. 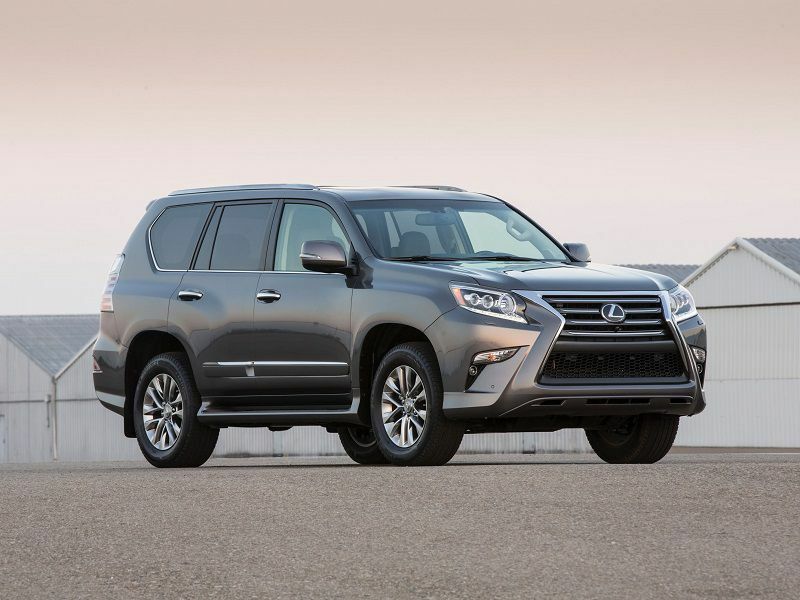 The 2019 Lexus GX 460 has not yet received a crash test rating from either the National Highway Traffic Safety Administration or the Insurance Institute for Highway Safety. It’s easy to miss the 2019 Lexus GX. Even if you’re shopping for a three-row luxury SUV, the model may not be on your short list. This is understandable. It’s a crowded class packed with excellent vehicles, and Lexus doesn’t spend many marketing dollars pushing the GX. Plus, its dealers steer more customers over to the more modern and technically advanced RX, which now is available with a third row. 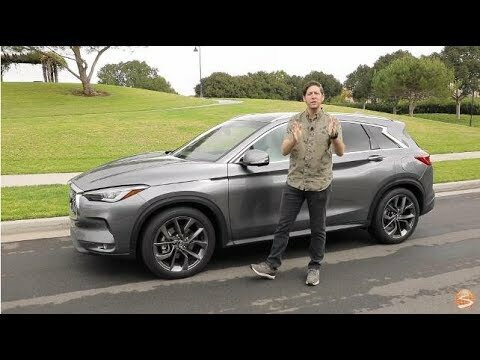 But the GX is definitely worth checking out. It offers SUV buyers a unique blend of Lexus comfort and refinement, along with family-friendly features and rugged off-road capability. It’s also quite powerful and fun to drive. If you’re shopping for a seven-passenger luxury SUV, the 2019 Lexus GX 460 is a solid overall choice.